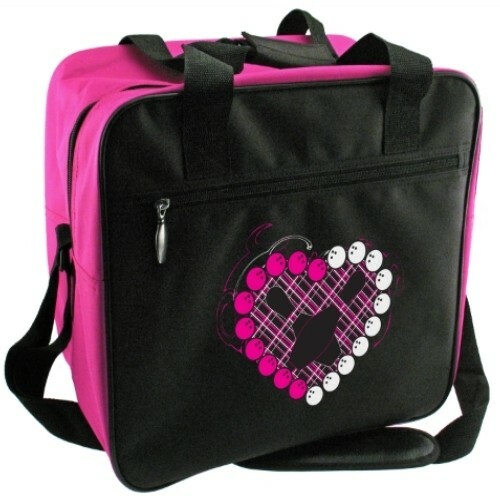 Pink Heart Single Tote holds 1 Ball and 1 Pair of shoes. Outer front pocket with bowling pin zipper is perfect for other bowling accessories. This is even cuter in person than online. The zipper pulls are little metal bowling pins too which are so fun. The colors are very vibrant. Hello, this bag can hold one pair of shoes up to a men's size 14. There is a ball cup on the inside of this 1 ball tote. Is there any warranty with this bag? This bag should have a 1 year manufacturer warranty. Due to the time it takes to produce the Classic Pink Heart Single Tote ball it will ship in immediately. We cannot ship this ball outside the United States.